The Kremlin has confirmed that US Secretary of State John Kerry will meet President Vladimir Putin in Sochi on Tuesday after talks with Foreign Minister Sergey Lavrov on the situation in Ukraine, Yemen, Iraq and Syria. Moscow’s sees Kerry's visit to Russia as positive, since the adjustment of the troubled relations between Russia and the US is only possible through political dialogue, the Kremlin said. The agenda of the meeting will be broad, but will not include anti-Russian economic sanctions introduced last year by Washington and its allies. “...bilateral relations first, and only then all the hot spots,” said Putin’s spokesman Dmitry Peskov. He also explained why economic sanctions against Moscow are not up for discussion. “We have repeatedly stressed that this is not the issue with us. This is not an issue of our agenda. But when our partners raise the issue, we naturally state our position,” Peskov said. Russia's Foreign Ministry said that Moscow is ready for the dialogue with Washington. Russia is "open for cooperation [with the US] on the basis of equality, non-interference in internal affairs, and taking Russian interests into account without attempts to pressure us,“ the ministry said in a statement. "This trip is part of our ongoing effort to maintain direct lines of communication with senior Russian officials and to ensure US views are clearly conveyed," State Department spokeswoman Marie Harf said in a written statement. Secretary Kerry will travel to Sochi, #Russia and Antalya, #Turkey this week. Details at http://t.co/oGgx9iKVg2. Earlier, RIA Novosti news agency quoted a Russian diplomatic source as saying that Kerry's arrival was "very symbolic,” since the top US diplomat had canceled the trip several times. 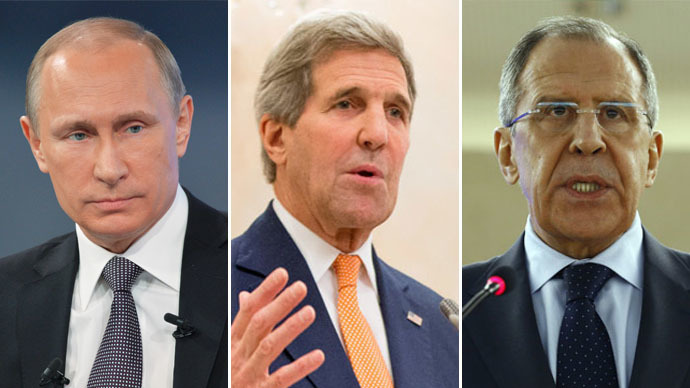 This will be Kerry's first visit to Russia since the outbreak of the crisis in Ukraine in November 2013. Lavrov and Kerry met last in March during the Iran nuclear talks in Switzerland's Lausanne, where several world leaders were working hard to hammer out a final decision on Iran's nuclear program before a looming deadline of March 31. Last time Putin and Obama met was at the G20 summit in Australian Brisbane in 2014. The US president also declined Kremlin’s invitation to attend the May 9 celebrations in Moscow. The death toll in the Ukrainian conflict has exceeded 6,100 people, according to UN estimates from April 2015. There was a scaling down the level of violence in eastern Ukraine since then, but little progress in finding a long-term solution that would restore peace in the country.